Dr. Lathrop from DEENR leading a group of STEM Ambassadors in mapping Superstorm Sandy tree damage using geographic information systems (GIS), and global positioning systems (GPS). Celebrating its 11th year, the Rutgers 4‑H STEM Ambassador Program for urban youth will be held at the School of Environmental and Biological Sciences at Rutgers. From July 8-12, sixty high school students from Elizabeth, Jersey City, Newark, New Brunswick, Passaic, Paterson, Trenton, Rahway, and Atlantic City will participate in several hands-on activities as they explore biochemistry, biotechnology, marine and environmental sciences, physics, and engineering alongside a number of Rutgers faculty from these and other disciplines. 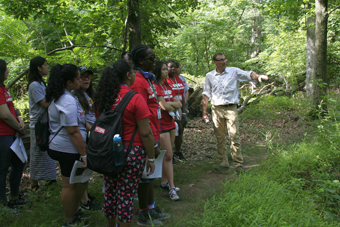 "The students will spend a week with Rutgers scientists--touring their labs, learning about their research, and how their scientific inquiry is relevant to our daily lives," said Chad Ripberger, Rutgers Cooperative Extension 4‑H agent, Mercer County. "The students will also have the opportunity to live on campus for a week and get a taste of university life. That will be an important experience for them, as they think about their futures and where they want to be in a few years," he added. Sammy Fonseca is an alumna of the program. "This was my first overnight visit to a college campus, and it was pretty amazing," said Fonseca. "I didn't realize science involved so much and that there were so many opportunities to explore. It has always been one of my favorite subjects, but after this week, I am much more confident. I enjoyed the biotechnology sessions the most, but I also enjoyed marine science and the activities we did at Sandy Hook." The annual Rutgers Rutgers 4‑H STEM Ambassador Program began in 2009, with 45 students drawn from similar urban communities around New Jersey, with the objective of encouraging youth to participate in science and research in a series of interactive activities, and gain a better understanding of opportunities available in science, engineering, and technology. 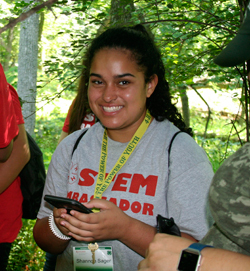 STEM Ambassador collecting data as part of an effort to map Superstorm Sandy tree damage using geographic information systems (GIS), and global positioning systems (GPS). "Part of the growing 4‑H youth development mandate is to prepare and empower our youth to get involved in a career in science." said Ripberger. "Several years ago, a series of national reports sounded alarm bells among youth development specialists about the need to engage our youth in science and technology, across all backgrounds, but especially in our urban communities." While the overall objective of 4‑H has always been the development of youth as individuals and as responsible and productive citizens, the 21st century model of 4‑H has expanded to serve a variety of communities, including specific programming for urban youths. The 2006 National Academies report, Rising Above the Gathering Storm, highlighted the shortage of highly qualified educators and mentors who can translate and teach science, engineering, technology, and math content and skills. A 2007 report from the National Association of State Universities and Land-Grant Colleges identified science, engineering, technology, and math for youth as a growth area. National 4‑H later unveiled SET as a critical part of its mandate, and according to Ripberger, "Rutgers Cooperative Extension has since been playing an ever-increasing and vital role in creating interest and competency in these areas." 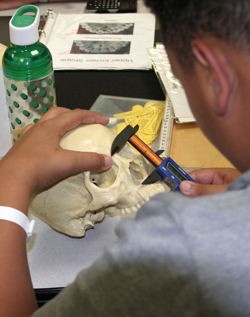 Student measuring features on a scull to determine gender and ethnicity as part of the unit on Forensic Science. Participants in the summer program have completed their freshman year in high school and were selected based on teacher recommendations and participation in an extensive application process that included writing an essay and interviews by their local 4‑H staff. As a condition for participating in the program, each of the selected youth has to provide a minimum of 50 hours of service to their local 4‑H program. This commitment includes working with 4‑H staff in their community to provide science-focused after-school and summer programming to younger youth and children. Key collaborators in the annual urban summer science program are drawn from county 4‑H youth development and 4‑H SET staff who have worked to expand the university's outreach in the urban communities of the state and create interest and competency in the areas of science, engineering and technology.